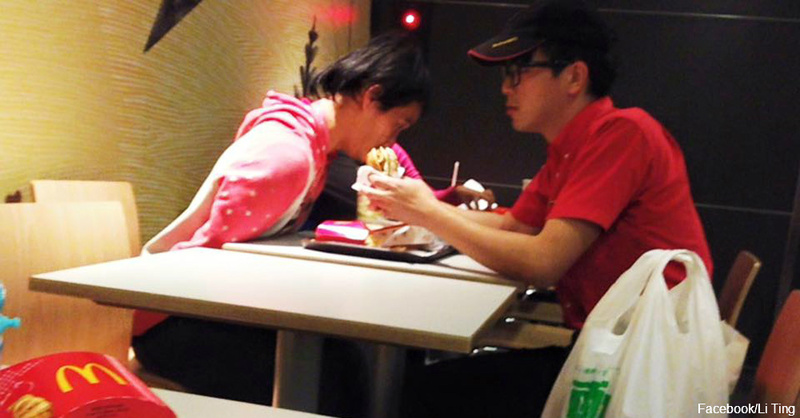 When a disabled customer ordered food at the McDonald’s in Chaozhou Town, Pingtung County, Taiwan, the worker named He could have just served him and been on his way. A McDonald’s spokesman stated that He, who is 19 years old and studying at a university, has been working part time at McDonald’s for the last two years. He was working the night shift on March 2, 2016, when a disabled man came in at about 11 p.m. Since it was late, the restaurant was already packed with customers getting their midnight snacks. After the disabled man placed his order, He told him he could wait upstairs. When He brought the man his food, he saw that grabbing the burger was difficult for this man. He offered to help, and despite how busy the place was, he took the time to help this man eat the entire meal. A woman nearby was so touched that she snapped a picture of He holding the burger up so the customer can take a bite. Metro reports that on March 9, a Facebook user named Li Ting posted the photo and a description of what happened. He became a social media star, as the post had almost 1,000 shares and over 25,000 likes within a month. The McDonald’s spokesman also said that the company plans to reward He for his kind actions. Have you ever witnessed an employee go above and beyond to help a customer? Please share!